So what is Rally, exactly? The AKC describes Rally as “a sport in which the dog and handler complete a course that has been designed by the rally judge. The judge tells the handler to begin, and the dog and handler proceed at their own pace through a course of designated stations (10 - 20, depending on the level). Each of these stations has a sign providing instructions regarding the skill that is to be performed. Scoring is not as rigorous as traditional obedience. Learn more about AKC Rally regulations (PDF document will download to your computer), including a list of Rally signs and their descriptions. What makes Rally different from traditional Obedience competitions? Unlike traditional Obedience, communication can be unlimited and is not penalized in Rally. Handlers can talk to, praise, or use any verbal means of encouragement. At the novice and advanced levels, handlers can also pat their legs or clap their hands. 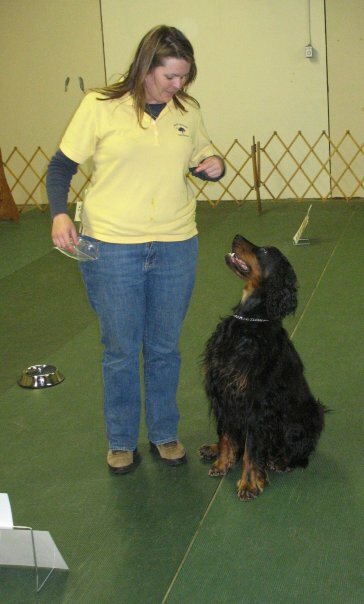 Rally is a great way to give teams the confidence and experience they need to continue on to traditional Obedience competitions, if they wish. What does the Greater Columbia Obedience Club offer in Rally? GCOC Rally instructors have all titled their dogs in Rally and enjoy introducing newcomers to this sport. Rally classes are designed to be taken in sequence to prepare teams to be successful in the Rally ring. GCOC currently offers AKC Rally, but many members also compete in other Rally venues such as the United Kennel Club (UKC) Rally, CDSP, C-WAGS and World Cynosport Rally (formerly APDT). For more information about the Greater Columbia Obedience Club's Rally program, contact us.